Yesterday we took a walk around Plas Middelwaard. We met horses and hooglanders (highlanders) or as the Scot's call them Highland Coooo's, according Mike VE3WDM. Luckely the anaimals are very relaxed. But as you can see the horns have dangerous points. It is adviced to keep a distance of 25 metres (27 yards) to the Highland Coo's. 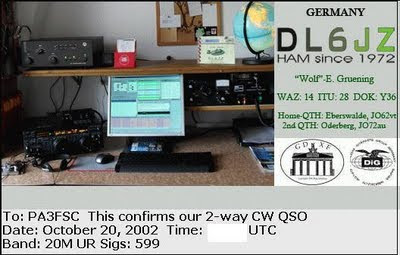 Log Checking Report ofthe CQ WW DX CW contest of 2010. Only 3 Calls I copied incorrectly. With the data of the report I can correct the calls in my log. 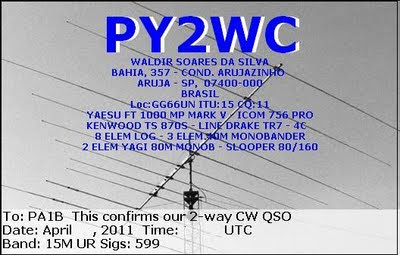 In 3 QSO's my call is not in the log of the other station (Not in Log). 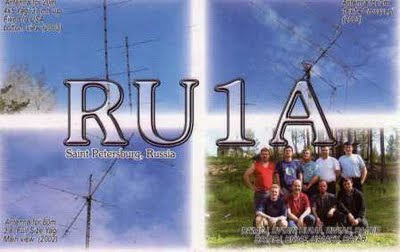 All 3 QSO's made with 5 watts. From all QSO's (10), in which my call was reveived incorrectly, only 1 was made with QRPp. 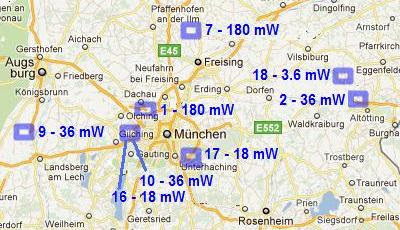 The rest (9) were made with 5 watt. We have been on holiday to the Azores. My wife and I were on the island Terceira. We were in a hotel with a beautifull swimming pool. The FT-817 went with me in the suitcase and did a great job. 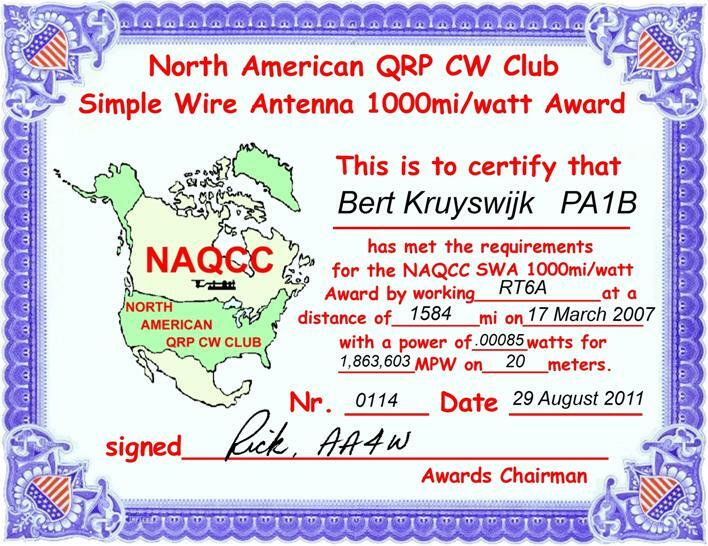 During the IOTA contest I used an end fed wire of 20 meters, fed via a 300 ohm ribbon like a Zepp. The ribbon ran from the balcony 3 meters up and from there the 20 mtr wire ran in to the garden. Only in the IOTA the antenne was out during day ligth hours. The antenna is matched by a homebrew light weight tuner. Further I used a homebrew light weight paddle. I used the FT-817 with a power of 2.7 W, 1,8 W, 800 mW and 360 mW. 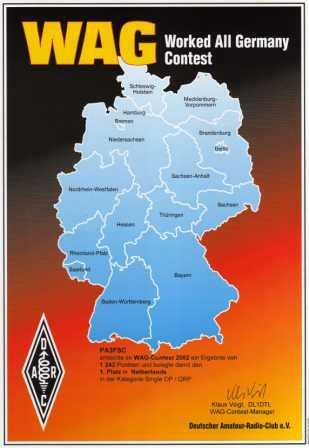 At 17.00 UTC I started in the IOTA contest. After 5 QSO's I we went to see the bulls in a street near the hotel. We were standing on the back of an open truck. It was spectaculair to see. When the bull hitted the truck, I had heart rate over 180. 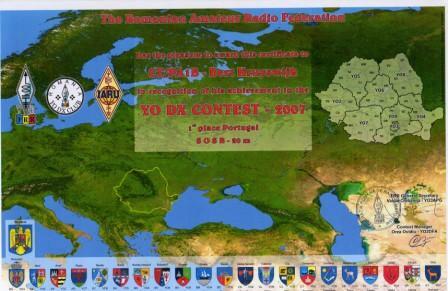 After diner I continued in the IOTA contest at 22:15 utc and continued until 02:00 utc. This was later then planned, but I did not want to mis the fun. In the days before I had noticed that the best propagation was in the evening. The next morning it was more difficult to make QSO's. 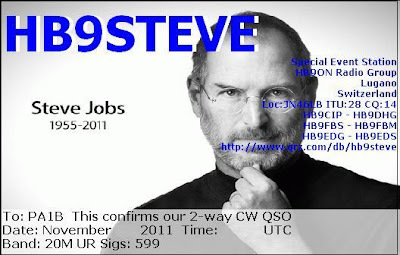 So after 3 QSO's in one houre I stopped. The total of QSO's is 50. Not bad for a maximum power of 2.7 wats. Before the holiday I was wondering wether my power would be enough. On holiday I work on a 12V 4Ah battery. The maximum power, when fully charged, is about 2 watts and drops fast to 1 watt. During the holiday we met Antonio CU3AC, who showed us the island and invided us at home for an excellent prepared Alcatre. Antonio offered me to use a power supply. So I could unleash a maximum power of 2.7 watts. Thank you Antinio. As a milliwatts enthusiast I have used QRPp when the S-meter indicated a very strong signal. 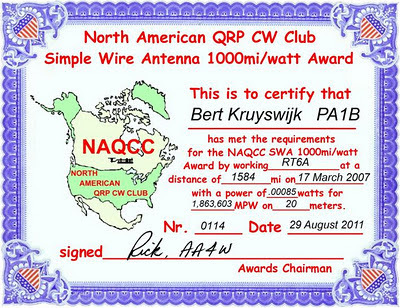 By doing so, I even made about 8 QSO's with more than "1000 Miles per Watt". I had great fun in the IOTA contest, during an unforgettable holiday.